This question is flawed on multiple levels. First, it ignores one of the fundamental problems addressed in the debates, what Michelle Bachmann has coined “the magnet.” In order to solve the problem, we must address the “benefits.” If illegal aliens couldn’t get a job, collect transfer payments, or utilize other government services, many would leave of their own accord. But for Google and Fox, addressing the economic impulses isn’t an option. 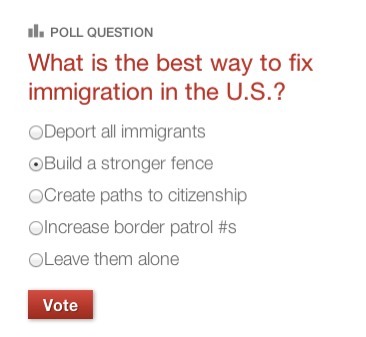 Further, the first option is “deport all immigrants.” No one wants to deport all legal immigrants. In fact, it’s possible the United States should increase the number of legal immigrants allowed into the United States each year. Equivocating between “immigrants” and “illegal aliens” guarantees a skewed result. The insurance question presents a false choice. 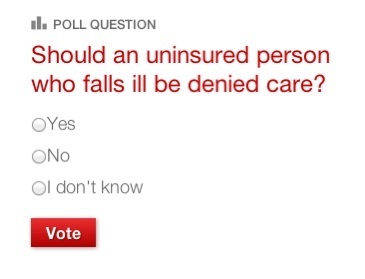 There’s no reason to assume that just because a person is uninsured they will automatically be denied care. Insurance is not the only way to pay for medical services, nor should it be. Read more in GOP, Media, Health Care.